The Nvidia Shield TV, aka SATV & nSATV, is an Android TV (Googles modified version of Android for use in the 10’ living space) device using Nvidias own X1 SoC (System on Chip) which was launched in May of 2015. The SATV comes in 2 models, a 16GB model which can be expanded with external storage (if you adopt the storage) and a 500GB (Pro) model which uses a SHDD for its internal storage. In Jan. of 2017 Nvidia relaunched the Shield with nearly the same specs as the original model, less an IR receiver, SD Card slot & micro-USB port, as well as being a smaller size for the 16GB model. The 2017 Pro model of the SATV has the same exact specifications as the 2015 model but comes with an updated game controller & remote. (Note: There is no actual 2017 Pro as it is the exact same device as the 2015 model.) Both the 2017 16GB & Pro models come with a game controller and remote, unlike the 2015 model which only came with a controller. In Sept. of 2017 Nvidia relaunched the 2017 16GB Shield with only a remote included. There is however, still the choice of buying the 2017 with the remote and controller. 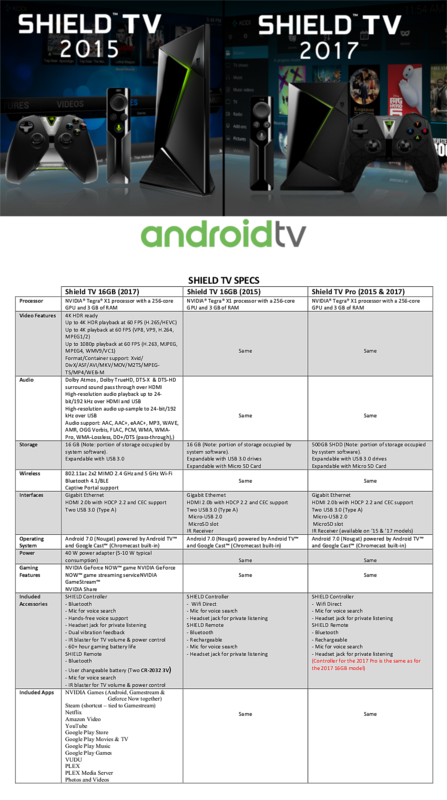 For non Kodi discussions about the Shield please see the nVidia GeForce forums. You can access the Recent apps menu by double tapping the Home button. This will allow you to quickly switch between apps you have recently used. As of the Oreo update, long press of the Home button no longer pulls up the Screenshot/Video capture feature, this is now defunct. Long press Home now pull up the "App tray", which can be accessed at any time, even from within other apps. PIP (Picture in Picture) – This allows videos to play in a small window in the upper right hand corner of your screen while you navigate through a menu, Leanback Launcher or other apps. However, to use this feature apps have to support it (currently the only one I’ve seen that does so is Live Channels, though there maybe others). Also, you cannot use PIP while a 2nd videos is playing. If you start another video while using PIP it will close. To activate PIP in Live Channels, launch it then pull up the menu by pressing the select button on the remote, “A” on the controller (considering you have Live Channels setup already) scroll to the second row and select PIP. Remote doesn’t update. If this happens and you get an error message when trying to update the remotes firmware, first reboot your Shield (may not be necessary) then go into Shield Accessories and forget the remote. Re-pair the remote then attempt the update again. Writing to external storage. Although storage permissions are the same as in previous Android versions, now write access is less intrusive than before. Now the only requirement to get full access to a drive is to “Allow” access via a pop-up window when attempting to write to external storage. This still requires that the app asks for permission, something Kodi does not do, but no longer requires going out of the app to set the permission. 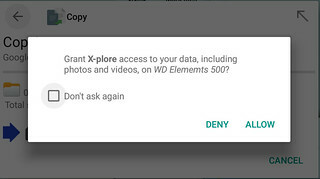 Allowing the app to write to the external storage is something that you should only have to do once, since after you grant it permission it will not ask again. NOTE: This has not been fully tested and it is unknown what will happen if you eject the drive then plug it back in. Audio artifact may be heard when pausing content with AAC bitstreamed audio. Rare occurrence where update halts (reboot to fix). Rare occurrence where network connection lost after 15 minutes. Google Play Movies & TV channel appears after reboot, even when removed. There is an issue if you have frame rate switching and audio pass-through enabled which may cause stuttering or lose of audio. If you encounter this set the playback delay in Kodi/SPMC to 2.5 seconds. The 2.5 sec delay should work for most users, however, it may require more or less time depending on your specific setup. It is NOT possible to write to mounted NASs. There is limited write capabilities with 5.2, however, which requires apps be white listed, this appears to limited to Plex as of now. Kodi should be added to the white list so that it too can write to mounted NASs, but this will not come until a later update. Deinterlacing live TV content is broken with Kodi v17. It's recommend to use the Live Channels app for OTA streams, see the second post for more info. If you're seeing issue with Live TV you can install v18 (Liea) nightlies and see if that fixes your issue. If you use the Live Channels app using the "Network TV tuner (Beta)" feature with a HDHR, it will not release the tuner when switching channels or leaving the app. You will need to force close the Live Channels app before it release the tuner. For those using the firmware prior to the Oreo update you can rollback to an older version of Live Channels, with the Oreo update you can not roll back. NVIDIA has announced the voluntary recall of certain plug heads for SHIELD AC wall adapters designed for use in continental Europe, which the company will replace. The affected product shipped with SHIELD World Charger Kit, and European SHIELD tablets and SHIELD TVs between July 2014 and May 2017. NVIDIA has determined that the two-prong European plug head may break, posing a risk of electrical shock.NVIDIA is asking customers to visit http://www.nvidia.com/support/adapterrecall for information on how to obtain a replacement European plug head. The recall does not affect any other NVIDIA products. Google Assistant is now available with the Nvidia 6.0 update, though only currently supported in the U.S. (a Google limitation). You can, however, use GA by going to Settings > Language and changing it to English (United States), if you are located in a different country. GA on Android TV is still a WIP and though somethings work, other things work only to a certain degree or not at all. For instance, you can say "Ok Google, find Movie X" and you will see apps which that movie is in including Kodi, however, if you say "Ok Google, find Movie X in Kodi" it will respond with "Kodi can't be searched". As well, it seems to be hit or miss with some movies, so even if you have a movie in your library it may not find it. And in some cases you need to very specific, "find Ghostbusters" for instance will only return results (and not even the correct results) for Youtube and Google Play, however, "find Ghostbusters 1984" will give you results for Kodi, SPMC, Plex and MrMC. The game controller does not need to be "on" to use the hands-free voice commands. The controller features an ultra-low power mode when not in use which allows it be an "always listening" device. This can be toggled on and off via a setting at the bottom of the home screen. The Spot is an add-on peripheral that contains a mic and speaker and plugs directly in to a wall outlet. The Spot along with Google Assistant will allow you to turn your Shield in "always listening" smart home device and personal assistant, similar to a Google Home. 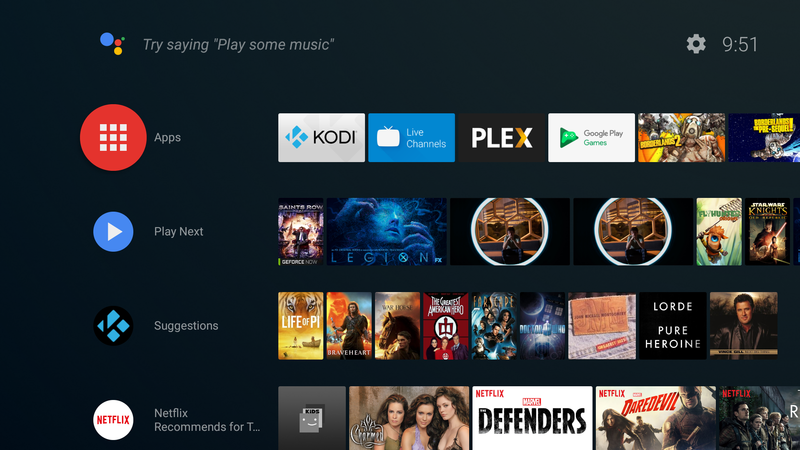 How or if it will allow you to control Kodi through voice commands is unknown as the Spot is not released and isn't due out until later this year. Update 10/07/2017: The Spot is still on the roadmap to be released. However, it has been delayed (this appears to be due to Google releasing the Home Mini at the same price point, $50, as what the Spot was supposed to cost). When Nvidia plans on releasing it is still unknown, but it has not been taken off the table. Adopted storage, also referred to as expanded storage, is a Android 6.x and above feature that allows you to connect external storage and adopt it as internal storage thereby expanding the capacity of the internal storage. This will allow you to install more apps than you normally would be able to with the limited storage that comes with the 16GB model (this should NOT be used with the Pro). It will also allow you to have a much larger library with Kodi without the concern of running out of storage space. To avoid slow downs, adopted storage should at least be rated 60MB read and 30MB write, though 90/40MB is recommended. NOTE: Because of where the Plex Media Server (PMS) stores its data, you will not be able to move it to the adopted storage. Therefore your PMS data will continue to use the real internal storage for data. Keep in mind before using Adopted Storage, that once you adopt it, that storage becomes useless for anything else since gets encrypted and becomes apart of the internal storage. You will not be able to connect it to your PC and modify it's contents and if you reset your Shield it will become useless until you reformat. External Storage (non-adopted) -- Changed with the 5.0 update - see Update. The Shield is compatible with FAT32, exFAT, NTFS & HFS+ formatted storage, and most drives should work. There are, however, limitations with using external storage on Android, the major being that apps (by default) only have permission to write/delete files in their own app folder on the drive. When you plug in your storage Android will create a "Android" folder, as well as a sub-folder "data" and when you launch an app (the storage has to be connected) it will create its folder there. There is an exception to this limitation, which is the app asks for full permission to other folders or the root of the storage, something Kodi does not do. UPDATE: A user on the Geforce forums HERE discovered this. Now, although you still can not write to the root of external storage devices without an app being granted permission, you can write to a new folder that will be created on your drive called /NVIDIA_SHIELD. All apps will have full permissions in this folder including Kodi/SPMC and over SMB. NOTE: If you are accessing your Shield from a PC, a external drive my appear as having root access. However, in reality it is only access to the NVIDIA_SHIELD folder. If you think that you are in the root of the external storage and are able to write to it over SMB then you need to check with a file browser on your Shield since the files will have most likely been written to the NVIDIA_SHIELD folder and not the root of the drive. The 2017 16GB Shield no longer has a micro-USB port, however you can still connect your PC to it via USB. This requires a USB type A to USB type A cable or an adapter, and has to be connected to the USB port closest to the fan grill. Then navigate to Settings > Storage and Reset and select "Using USB" under "Shield Storage access". NOTE: Currently, hardware deinterlacing is broken for Kodi and it is not recommended. For OTA/Live TV use the Live Channels app which will provide property deinterlacing or for HDHR tuners the HDHomeRun app. There are currently 3 ways to add OTA sources to the Live Channels app. 1. TVHeadEnd Live Channels beta (link below) - This will allow you to add your TVHeadEnd backend as a channel source. The downside to this is that there is no DVR/PVR capabilities (should get added at some point) and although Timeshifting has been added in the recent v0.3.7 update, it is in the early stages of development and only sort of works. 2. HDHomeRun app - Works well as a standalone app or added as a channel source for the Live Channels app. The downside to the this is that for expanded EPG data and DVR you have to use their paid service. As well, you have to use the HDHR app for DVR. 3. Network TV Tuner beta (requires HDHR tuner, Android 7.x+ & currently only available in the U.S. market) - This is built into the Live Channels app and is a result of the collaboration between Google & Silicondust. It works for live streaming, timeshifting & DVR. The downside to this is, it requires adopted storage for the DVR feature on 16GB models (recordings can not be saved to user defined storage & is only stored on internal/adopted storage). As well, users may find that the wrong EPG data is scrapped for their channels and users with connected devices that don't support AC3 decoding will most likely not get audio for channels with Dolby Digital. *HDHomeRun (CONNECT, EXTEND, or PRIME). *TVHeadEnd backend for Android TV - tested and working. Nice update my friend, I knew you would be all over it sooner rather than later ! (2017-01-17, 01:11)wesk05 Wrote: It looks like folks with newer HDMI 2.0 AVRs (HDCP 2.2 HDMI port) connected to HDMI 1.4 TVs will be in for a surprise. Not only has the refresh rate switching bug not fixed, you can't even change the refresh rate or color space in such configuration. It seems to falls back to RGB 1080p59.94Hz. Thanks wrxtasy, still got somethings to add since I just received some updated info tonight. There has been some discussion that the 2017 16gb version lacks an ir receiver. Does anyone have any info? Yes, it does NOT have an IR receiver, it's stated in the description at the top of the OP. The remote and controller have IR blasters, but that's so that you can control your TV. Have anyone from Nvidia confirmed that they will definitely officially release Android TV 7.0 for the 2015 Nvidia Shield TV? Also, if so and since hardware is very similar will you just continue using same Nvidia_SHIELD_Android_TV (wiki) article? Yes, it has been officially confirmed that the older Shields will get the Nougat update. Yes, there is no need for a new wiki page. However, it does need updating and I will try to get around to doing that in the next couple of weeks. But since the wiki is community driven, anyone that wants to can make the necessary changes to the wiki page. Is it confirmed that the 2017 Shield TV Pro will still use an SSHD? And can we easily replace the drive this time? So does the new combination of Android 7 and shield experience 5 restore 4K 10bit 24hz playback or does it still. Switch to 8bit rgb? NOTE: Because of where the Plex Media Server (PMS) stores its data, you will not be able to move it to the adopted storage. Therefore your PMS data will continue to use the real internal storage for both data and transcoding. I thought I read on the Geforce forums that adopted storage could be used for transcoded files, but not data? (2017-01-16, 11:11)DaMacFunkin Wrote: So does the new combination of Android 7 and shield experience 5 restore 4K 10bit 24hz playback or does it still. Switch to 8bit rgb? Regarding HDMI CEC function? Is it all ok? Switching on the Shield (through AVR), TV switch on and switch on right HDMI input? Regarding not supported files, which are ones not supported? Regarding PQ, is it comparable to (at least) Zidoo X9S/Himedia Q5 Pro and Popcorn A-500? (2017-01-16, 10:12)badbadbad Wrote: Is it confirmed that the 2017 Shield TV Pro will still use an SSHD? And can we easily replace the drive this time? The Pro is the exact same model, there's been hardware changes to it. And it's never going to be easy to swap out the drive, Android is not Windows. (2017-01-16, 12:40)tredman Wrote: I thought I read on the Geforce forums that adopted storage could be used for transcoded files, but not data? Quote: HOW SHOULD I SET UP MY SHIELD TO GET THE BEST PLEX MEDIA SERVER PERFORMANCE? For the best media server performance, it’s recommended to use an Ethernet connection between your SHIELD and your router. Also, if you are mounting a NAS to SHIELD, it’s recommended to use an Ethernet connection between your NAS and your router. This configuration will provide the maximum available bandwidth for your Wi-Fi network for serving content to your mobile devices. Plex also recommends that you maintain sufficient free space on your internal storage for video transcoding, roughly equal to the size of the source file of the transcode (this can average around 4-5GB for a full length HD movie). Transcoding vs transcoded - if i understand it correctly once files are transcoded (or optimised in plex speak) for plex sync they are stored on the adopted storage once the transcoding is complete.